For the ones that don’t know, Black Friday is a big shopping event that begins after Thanksgiving Day in which supposedly awesome discounts on items occur. It’s a day of insanity I avoid at all costs. In the US people actually camp out in front of the stores just to be there when they open. The ‘official’ start to Christmas shopping season starts after Thanksgiving and competition-driven businesses started to offer discounts and sales earlier and earlier until right after the Thanksgiving and eventually these sales have become such a big ‘thing’, this phenomenon was given a name: Black Friday. ‘Black’ being a term that means business gains and profits, as opposed to ‘red’ which means business losses and debt. But while some stores might benefit from this crazy phenomenon… do we? Does the planet? Slowly but surely, the Black Friday craziness has spread around the globe, promoting unnecessary overconsumption and some unfortunate last-minute purchases that we never end up wearing. While I love a good bargain and can see the point in waiting till the sales roll in, I’m genuinely grossed out by the insane shopper behavior videos that are popping up on social media the day after Black Friday. So, for the first time, I’ve decided to support the Anti-Black Friday movement and to team up with the amazing Elena Hilman to give you some of the most unexpected, coolest DIY tricks to jazz up your old clothes. Try these little gems out for yourself and you’ll get some new items in your closet… for free! Have a plain color or jean shirt in your closet? Have a lot of sets of stud earrings? This is the easiest DIY ever: pin the studs on the collar of your shirt. Ta-da! A couple of things to watch out for: make sure you mark the middle of both sides of your collar with a pencil, this makes it easier to place the earrings evenly. Make sure you use studs with a thinner “leg” so they don’t leave a mark on the fabric. Experiment with simple and excentric earrings for a different effect. Do you have an old chain neckless you don’t wear anymore? Add it to the collar for some wow effect! Going somewhere nice? Pin up a cardigan with a pretty broach to give a bit of shimmer to your outfit… (and to keep warm). Fasten the shawl a bit asymmetrically over your shoulders for a cool “I don’t care vibe”. This simple tip will suddenly open up so many options for something to throw over an elegant dress for a night out. I’m planning to try this trick with my Karigar cape to give it a more “evening” look. Do you have a favorite bag you wish you could’ve kept around for longer, if only it’s strap wouldn’t be so cracked and old? 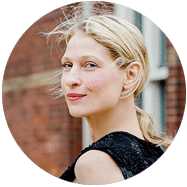 Elena is sharing one of her secrets that will not only prolong your purse’s life but will bring even more diversity into your wardrobe: simply take off the old strap and replace it with a rolled up scarf. Want to keep up with the latest trends? Invest in a few different scarves with a fashionable print and swap them as often as your heart desires. 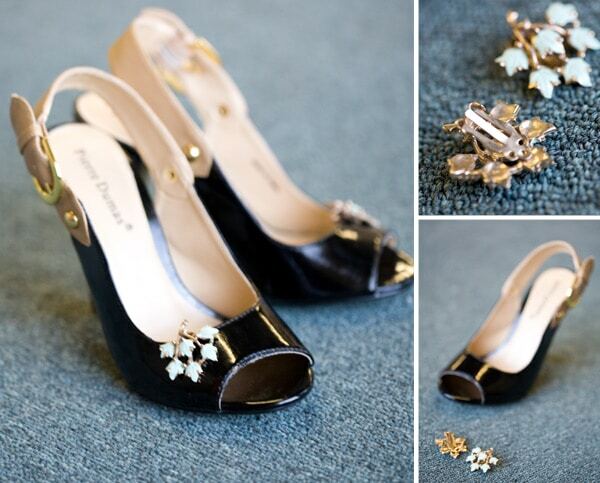 Do you have a pair of pumps and some pretty vintage clips? Put the two together and you’ll be the belle of the ball. To avoid leaving a mark on the shoe, put a thick fabric on both sides of the clips. Make sure you secure the clips with a medical plaster on the inner part, just so the metal won’t rub your foot. You know how many times you thought: I wish I had a scarf in a certain color to match my outfit. Now you do. 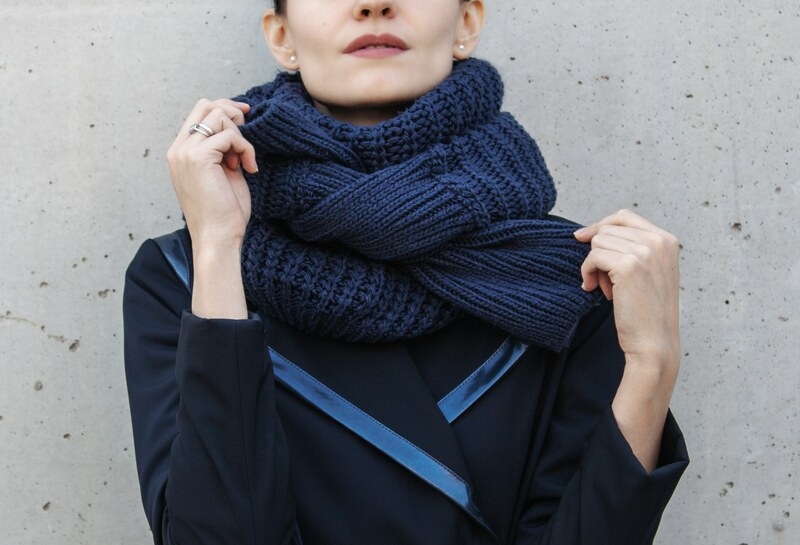 Any sweater can become a scarf: just drape it around the neck like in the photo below. Stylist and fashion editor Elena could not agree with the principals and the unsustainable views of the fashion world and has branched out into creating an absolutely beautiful content for ethical and sustainable brands. I love Elena’s modern aesthetic and an original way of thinking and can’t wait to see what other fun fashion tips she has in store for us in the future. Do you have a styling question or a comment on these DIY tips for Elena?